As I stand here before you today, I am reminded that the wise men and women of 1945 displayed a unique capacity to learn from and act on lessons of history. Shaped by the Great Depression, and tempered by the carnage of World War 2, they established global order through institutions that would provide security and stability for generations to come. The UN, the IMF, the World Bank and other organizations were founded to coordinate responses to international challenges and to make crimes against humanity a thing of the past. There can be little doubt that today, the scale, scope and speed of their imagination and efforts have not yet been matched. But future historians will judge these institutions on how they respond to the challenges of today, and the challenges we must confront in the future. As global leaders, we seek certainty and familiarity in the rules of the game which dominated the 20th century. But in today’s ever-changing world, the dominant contextual characteristic defining our times is extreme uncertainty. It is easy to illustrate this uncertainty by looking at threats we are facing to our economies, our security, and our values. There is an emerging consensus that advanced economies have yet to arrive at “proper growth models” to overcome high unemployment, decreasing income and wealth inequality. The threat of economic crisis, therefore, still hangs over us. Sixteen years after the tragedy of September 11, the threat of violence by non-state actors has taken the form of a Fifth Wave of political violence. Driven by transnational terrorist networks, criminal organizations, cyber-crime and state sponsorship of terror, this Fifth Wave promises to be a decades-long threat to international security rather than a passing phenomenon. In the 20th century, the world came together to push back the spread of fascism so that democratic freedoms could be secured. Today, these very freedoms are under attack from global terrorism. Terrorism is not only an attack on human life and basic freedoms, but an attack on the compact of citizenship–an attack on the nation state’s relationship with its people which makes democratic societies unique, fair and free. We must confront the threat of terrorism as a united force, and meet it with a long-term solution that matches the long-term agenda of the terrorists themselves. And, lastly, despite the incorporation of tenets of the Universal Declaration of Human Rights in the constitutions of most countries of the world, crimes against humanity still occur with painful regularity. The ethnic cleansing of the Rohingya is especially shocking. Aung San Suu Kyi’s lengthy silence was tragic, as our hopes that an icon of human rights would choose principle over power. I do welcome the chance for Afghanistan to have a seat on the Human Rights Council in order to have a more central role in discussions on these important issues. As a people who are still experiencing crimes against humanity – the latest being killing of civilians in the Mirza Ulang village and attacks on mosques in Kabul and Herat – we are keen to add our voice in support of human rights. Overcoming the destructive and disruptive patterns of change in the 21st century requires collective and coordinated action at the global, regional, national, local and individual levels. An effective, efficient and respected United Nations is the need of the hour–we must put our 20th century institutions to the test. Therefore, I congratulate His Excellency Miroslav Lajcak on assuming the Presidency of the 72nd Session of the UNGA. I want to recognize and appreciate the efforts of His Excellency Peter Thomson during the previous session, and I commend His Excellency Secretary General Guterres for launching his reform of the UN. If the UN did not exist today, we would have to invent it to address the demands of our time. Delivering on the promises of the Universal Declaration of Human Rights in the context of uncertainty requires reexamination of core functions, re-engineering of business processes, reinvigoration of organizational culture and value, and reform of systems of accountability. If the UN is to be more relevant to countries like mine, it must deliver as One UN. But this has not yet been fulfilled. The inherited model of the UN agencies as instruments of technical assistance and capacity building should be subjected to the market test, namely value for money and sustainability of results in comparison to government, private sector and non-governmental modes of delivery. Mutual accountability is a proven mechanism of consolidation and expansion of partnerships, and trust-building. 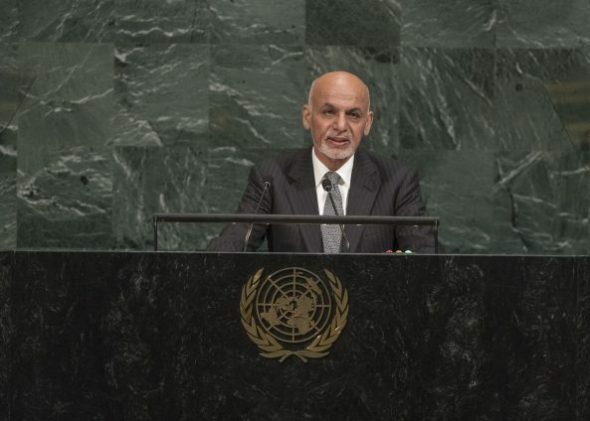 I am honored to stand before this distinguished assembly to represent and speak for the people of Afghanistan. We have borne adversity, deprivation and drought with dignity; met invasion with valor; defended our homeland with patriotic fervor. Being the frontline state in the global struggle against terrorism and the front line of defense of democratic freedoms, our people and security forces are accomplishing heroic deeds on a daily basis. We, too–as a nation, a state, and a people–are reinventing ourselves to address the challenges and potential offered to us in the 21st century. With President Trump’s recent announcement of his strategy to counter terror and stabilize South Asia, Afghanistan’s enduring partnership with the United States and the international community has been renewed and redirected. We welcome this strategy, which has now set us on a pathway to certainty. The Afghan people have looked to the United States for this type of resolve for years. We pay tribute to all the men and women of allied nations who have served with us, particularly those who paid the ultimate sacrifice. The strategy consolidates all instruments of American power, conveying a message that the Taliban and their backers cannot win militarily. Only through political settlement can we achieve enduring peace and I call upon all ranks of Taliban to engage in intra-Afghan dialogue. We now also have an opportunity for a dialogue with our neighbors on how we can work together earnestly to eliminate terrorism and contain extremism. I call upon Pakistan to engage with us on a comprehensive state to state dialogue on peace, security and regional cooperation leading to prosperity. The Afghan government has proven that we are committed to peace through our own internal processes, as demonstrated by the peace agreement with Hizb-i-Islami. Now, we call on all of our neighbors, near and far, to join us through the Kabul process in our comprehensive quest for peace and regional stability. However, moving forward, we ask for a change of perspective from our international partners. For too long, the conflict in Afghanistan has been viewed through the prism of civil war. But this war is not within our soil, it is over our soil. Today, there are over 20 international terrorist groups with an imposed presence on Afghan soil. The future of Afghanistan matters because we are on the frontlines of the global effort to eradicate the threat of terrorism. Our brave soldiers are fighting and dying for this cause, and the sovereignty of the Afghan nation, every day. Though we may be on the frontlines, the threat knows no boundaries. For terrorist groups who are harbored in the region, an attack in Kabul and an attack in Brussels, Paris, Barcelona, London or anywhere else are equal victories. President Trumps’ new strategy includes the disruption and denial of sanctuary to terrorists whose motives know no boundaries. However, a strong and enduring commitment from our international partners alone will not ensure our collective success in Afghanistan—the roots of success are indeed within us, as Afghans. Today, nearly three years into our decade of transformation, we are turning Afghanistan into a platform for stability. The foundation has been laid. We have articulated and are rigorously implementing roadmaps for reform. Namely, we are prosecuting the corrupt, ending corruption in the security sector, replacing systems of patronage with merit-based systems, and making financial processes transparent. We are also reaching out to those who had previously been excluded from society—young people, the poor, and women. Yet these people are our nations’ source of resilience. The generation who grew up in the 1990s, which make up the majority of our population, are now being entrusted with wholesale leadership of the country. A generational change is taking place as youth are empowered at every level. This generation will be the one that reforms the government into one that is citizen and service-oriented. Through unimaginable hardship, women kept the fabric of our communities and societies together even as they fell to shreds. Yet women were relegated to the very bottom of society. This was unacceptable and our nation suffered for it. Today, there are more Afghan women in government, in the workforce, and active in civil society than ever before in Afghan history, yet we still have far to go. At the helm, we have 6 women Ambassadors, and 4 women cabinet members. Simply put, women’s empowerment is crucial to our future. The poor, along with the women and the youth, are the numerical majorities in Afghanistan that crosses ethnic, linguistic, gender and religious lines. About 40% of Afghans still live below the poverty line. Research shows that poverty perpetuates itself because it affects the scientific make-up of a child’s brain. We must empower the poor. For far too long, they have been the silent majority in our country. We are recreating the bonds of society in order to change the culture of our state. And not only are we strengthening our bonds internally, but regionally. As we look to our neighbors in south and central Asia, we are simultaneously strengthening national, global and regional connectivity. Afghanistan will again become a multi-faceted hub in the 21st century–for transport, energy, water and mining–for the benefit of the entire region’s economic prosperity and security. And we are already seeing the fruits of our labor. Transmission lines for the Central Asia-South Asia power project are under construction. The Turkmen railway has reached our border. The TAPI natural gas pipeline is under construction. As a central part of our plan for economic advancement, we continue to work with our regional partners to seek avenues of collaboration. We can see now, amidst the uncertainties and unique challenges and threats of the 21st century, how Afghanistan has become a conundrum for the 20th century approaches in which the global order tends to still operate within. While the threat of international terrorism playing out on our soil has dominated the narrative of our country and driven the fate of our people for far too long, we also have enormous potential to be the regional brokers of peace, a hub for economic prosperity, and a beacon of democratic values. The birthplace of Rumi still resounds with messages of love, peace and hope. 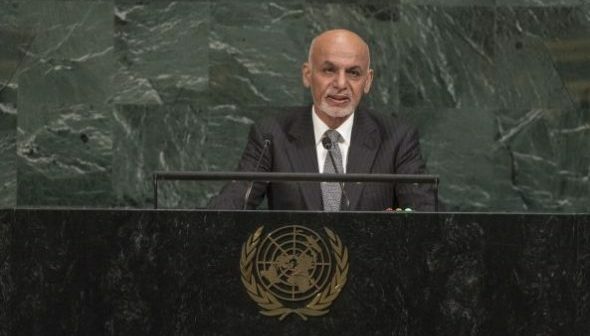 Afghanistan will, yet again, be the Asian Roundabout for dialogue of civilizations and a model of harmony and culture of tolerance and engagement. I am confident that our plans and programs for self-reliance and reform, bolstered by the commitment of our international partners, will chart us on the path toward realizing our full potential.